The recommendation, if implemented, is likely to face opposition from the government's key support base among Hindu traders and businesspersons. Archis Mohan and Joydeep Ghosh report. 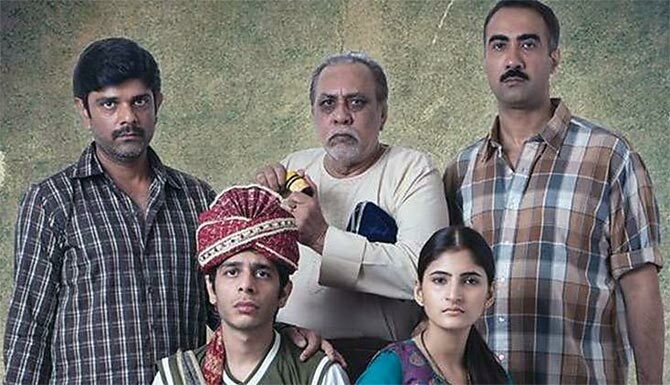 IMAGE: A scene from Kanu Behl's film Titli which revolved around a Hindu family in Delhi. Kindly note that the image has only been published for representational purposes. In a recommendation that can cause a lot of heartburn for business houses and taxpayers, the Law Commission last week proposed doing away with the concept of Hindu Undivided Family, or HUF. According to the income tax department statistics, there were almost 2 million registered HUFs till March 2018. In a consultation paper called Reform of Family Law, the commission came down hard on HUFs. The strongly worded paper says 'justifying the institution on grounds of deep-rooted sentiments at the cost of country's revenues may not be judicious'. The paper quotes former chief commissioner, income tax, T C A Ramanujam, as saying that 'the government carries out any amount of amendment to the Hindu law without looking into the revenue loss caused by the recognition of HUF as a separate taxable entity. 'HUF may be a boon to the taxpaying Hindu. But it is definitely a bane to government revenues'. An HUF is a separate tax entity under the provisions of Section 2(31) of the IT Act. Income tax experts believe this proposal has been made primarily because of the government's increased focus on tax compliance. "The government might be looking at HUFs from the perspective of taxpayers using it to reduce tax liability," says Kuldip Kumar, partner and leader, personal tax, PwC. "It is also possible that it is finding that this vehicle is being used for hiding any income," adds Kumar. "Given the big focus on compliance, the government is trying to plug all loopholes for tax avoidance." Confederation of All India Traders chief Praveen Khandelwal says his organisation, which claims to represent 50 million small traders across the country, would oppose any move to abolish HUF. "The view of the Law Commission on this needs to be changed. The institution of joint family is very much alive," says Khandelwal. "The karta of an HUF is the head of the joint family, and by virtue of that and the expenditure incurred to preserve and run the institution of a joint family gets a little relaxation in tax. Where is the question of tax evasion in this?" asks Khandelwal. Tax experts say an HUF does helps taxpayers to save on taxes by creating a separate tax entity. There are many tax exemptions and deductions that are allowed in the income tax laws, especially to an HUF. Doing away with HUFs may not be easy, say experts. "The intent of creation of a HUF was for ease of succession in case of a joint family. In case the revenue authorities want to avoid the use of HUF as a tax planning mechanism, they could look at the option of introducing specific anti-avoidance rules for the taxation of HUFs," says Amarpal Chadha, tax partner & India mobility leader, EY. "If the concept of HUF is abolished under the income-tax law, the taxation of existing HUFs may become complex," Chadha adds. The commission said the special status given to the entity of HUF was a 'so-called gift by the British' who could not comprehend the complex socio-economic structure of the Indian families. 'Now, this status is being used for the evasion of tax only,' it said. 'However, today when it has been 72-years since Independence, it is high time that it is understood that justifying this institution on the ground of deep rooted sentiments at the cost of the country's revenues may not be judicious,' the Commission concluded. In addition, the commission also recommended that coparcenary of ancestral property under Hindu law be abolished and the right in a property by birth be extinguished in favour of 'tenancy in common', instead of 'joint tenancy'. The paper has also recommended making it easier for couples to get a divorce, more equitable share for women in property at the time of divorce, abolition of polygamy among Muslims and doing away with the law on adultery. In June 2016, the Law Commission had been tasked with looking into matters related to the uniform civil code, a key promise of the Bharatiya Janata Party manifesto of the 2014 Lok Sabha election. However, the commission, instead of a full-fledged report on a uniform civil code, preferred a consultation paper to suggest 'piecemeal' changes in personal laws. The commission said it dealt with laws that are discriminatory rather than providing a uniform civil code, 'which is neither necessary nor desirable at this stage'. 'The issue of uniform civil code is vast, and its potential repercussions untested in India,' it said. It even came close to rejecting the notion of a uniform civil code and pointed to exceptions provided to specific communities. 'Most countries are now moving towards recognition of difference, and the mere existence of difference does not imply discrimination, but is indicative of a robust democracy,' it noted. Now, it will be up to the 22nd Law Commission to bring out a final report on the uniform civil code. The commission had put out a questionnaire in the public domain in November 2016 and received 75,378 responses. But it bemoaned the majority of the responses 'dealt specifically with the issue of triple talaq, which is one among the various other issues that need attention'. It said specific groups, or weaker sections of the society must not be dis-privileged in the process of reforming law. Where did 10% of taxpayers vanish?